Here’s a slice of real football 101 that the FIFA series knows all too well. Some parts of a soccer team are more interchangeable than others. For instance, wingers can be switched at will, right-backs can deputise as slightly wonky left-backs, even a lumbering center-half can be pushed up front in times of need. But on the other hand you don't go shoving Lionel Messi into defensive midfield or Ronaldo in goal. You can fiddle around with the extremities all you like, but the spine of the team is sacred. FIFA takes this football lesson to heart, and 14 builds on the same solid base as before, with only minimal changes to the lineup. Like that aforementioned wonky, wrong-footed left-back, though, some changes here are not always for the best. "It is a slower, more methodical game that can frustrate as often as it delights"
Such resistance to change is understandable. You get the sense the series peaked artistically with FIFA 12, and now EA Canada is left to play the role of tinkerman, fiddling around with individual components in an attempt to stay fresh and relevant. The trend for football games this year is capturing the sport’s unpredictability. PES 2014 achieves this through its 'heart' mechanic, where players having a bad game grow ever-more skittish and liable to make mistakes. In response FIFA has taken a different path, hoping to capture unpredictability through physics rather than psychology. This isn’t necessarily the direction FIFA should be going in. Last year's 'First Touch' feature, which saw the ball cannon off world class footballers' feet, was as divisive amongst fans as a Xavi pass. This year it works in tandem with a rebuilt animation system, which makes for a slower, more methodical game that can frustrate as often as it delights. "You're often forced to play the ball out wide to avoid the mass of humanity standing between yourself and the goal." This Frankenstein's monster of a feature is called 'Precision Movement', and the idea is that the more intricate animations make for a deeper game where every step counts. This is true to an extent, but the effect it has on the game's enjoyability depends on where on the pitch you happen to be. It's the midfield battles that suffer the most; leggy animations affect player stride and their ability to change directions smoothly, and give games a stop-start kind of flow. Precision Movement was designed in part to allow for greater playmaking from midfield but in practice the opposite is true, creating treacle-like, congested battles of attrition, where you're often forced to play the ball out wide to avoid the mass of humanity standing between yourself and the goal. With First Touch as unpredictable as ever, there are moments where you don't feel as in control of proceedings as perhaps you should. "Goals feel more organic and varied here than they have in a FIFA game for years." When you're through on goal however, you'll see the system in a new light. The step-based system meshes well with new ball physics and opens the door for some spectacular goals--dipping half-volleys, curled lace shots, and everything in-between. As a result, goals feel more organic and varied here than they have in a FIFA game for years. When the perfect shot comes off and nestles into the top corner, it feels magical rather than contrived. The players feel heavier than those in last year’s FIFA and it's easier to muscle nippy forwards off the ball – a rebalance that's superbly counterpunched by the Protect The Ball feature (mapped to LT), which sees the player shield the ball, buying valuable seconds for the cavalry to arrive during breaks. "Throw in the stunning TV presentation and the convenience of ready-built leagues, players, and stadia, and there's really only one choice for the casual fan." The result is a game that at first feels less cohesive than FIFAs past, but gingerly eases into a slow-paced cerebral affair, where dourness is punctuated by fleeting moments of inspiration and genius. FIFA 14's thirst for realism is a noble cause, and one that will find a sizeable audience. But the real reasons to plump for EA's offering, as ever, are ones that are shallow and valid in equal measure. 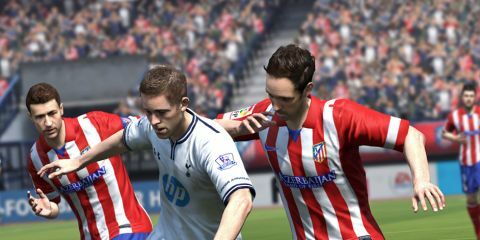 EA's financial muscle affords FIFA the kind of glitz and glamour that is forever out of the reach of PES. Throw in the stunning TV presentation and the convenience of ready-built leagues, players, and stadia, and there's really only one choice for the casual fan. FIFA 14's a great game--of course it is--but the series seems too big and bloated now to make any substantial changes. FIFA 14 requires more patience than most of its predecessors, and even when your patience is rewarded, it often feels like it's flattering to deceive. Slow and stodgy in midfield but dynamic and physical at either end of the pitch, it's possible that some might think this the best FIFA ever--but you'd be splitting hairs, not defences. This game was reviewed on Xbox 360.